Perhaps for the first time, the situation's profound danger and seriousness really strikes Frodo. Unfortunately, so does a Black Rider. The chapter opens with Black Riders seeking Bilbo's residence in Buckland, where Fatty Bolger is playing decoy by keeping house. The Riders definitely move with impressive speed, even taking in the difference between mounted and foot travel. Perhaps for the first time, the Black Riders openly announce their allegiance and backing, demanding "Open, in the name of Mordor!" This actually shows us a very strong example of hobbit stalwartness, with a raised cry of alarm and raising of the hobbits to defend Buckland. "Let the little people blow! Sauron would deal with them later." Why would Sauron have any special concern about the fate of the Shire above the rest of Mordor? What brings Saurman to the Shire with such spite? Other reasons may arise, but I think the seeds are right here in this act of unexpected defiance and show of strength. Over in Bree, Frodo wakes to some unknown disturbance, then falls back asleep dreams of moving wind and galloping hoofs. Clearly his dreams are attuned to the efforts of the wraiths, a connection Frodo either has yet to make or is deliberately avoiding making. To me, the connection speaks to a greater-than-realized awakening of the ring and Sauron. Should Frodo honestly share the contents of his dreams I believe it would raise some alarm from Strider (and Gandalf were he present). Morning dawns on the wreckage left in anger by thwarted hunters. The film clearly implicates the Black Riders in the destruction of the room, but Tolkien leaves it a bit vague. The guilty parties could be Riders not searching Crickhollow or it could be a mortal agent such as the missing Southern trader implicated in the theft of the horses. Now, these days most of us don't have much familiarity with horses for two reasons: they require space and they often involve a significant financial investment. In the economic framework of the Hobbit, it's an even bigger deal for one's horse to go missing. It's like you stayed over night at a hotel and woke up to find out that not only does your original room look like Mötley Crüe hosted a post-concert party, but that every car in the parking lot is missing. In the short run, Bill Ferny profits on our party's misfortune and sells them his much-abused pony. But in the long run it works out for the best. Tom Bombadil facilitates the return of the missing beasts, providing a silver lining to Butterbur, marking the start of a beautiful friendship between Sam and Bill the Pony, and likely saving the original ponys from a horrible fate at the hands (tentacles?) of to be encountered monsters. Well, now travel plans are all messed up, including a need for leaving openly by the main road rather than slipping off into the back country from the start. For all of Butterbur's distrust of Aragorn, the locals largely view him with awe (except, of course, for Bill Ferny). But it's still not that hard to slip off into the woods once down the road, so minus the late start date, nothing's too drastically changed. Off to Weathertop Hill! We get quite a bit in the way of weighted statements and bits of information. At this point, the mention of Gil-galad, beyond some connection to Mordor, seems largely superfluous (if lovely and rich world-building). 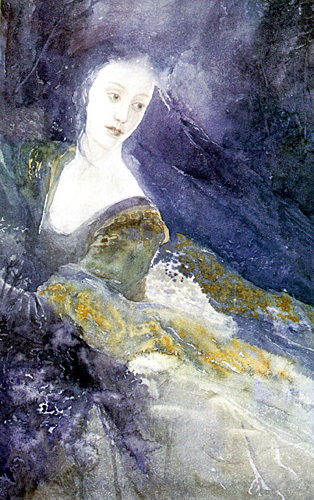 The tale of Luthien Tinuviel seems far more presently relevant, with the revelation of Elrond's lineage. In both cases Tolkien is laying the groundwork for deeper connection further along, with the grace of Gil-galad in the fight against dark forces and the lay of Luthien Tinuviel and the trials of Aragorn and Elwyn. What stands out to me in this chapter is how much Samwise reminds me of Bilbo. It's little things, and not just his singing. It's little details, like his reflections on comforts he'll be missing soon enough, and the accuracy of his throwing arm. Bilbo throughout The Hobbit always had a reflective streak in him, and out of the four hobbits here Sam's the one who's really exhibiting that trait. There's no Gandalf at Weathertop Hill (after all, that would be too easy), but there are signs that he was present and that he faced off against some threat. Our party is looking at a good two weeks to reach Rivendell, but that is now not only their best hope of sanctuary, but their best surety of meeting up with Gandalf. 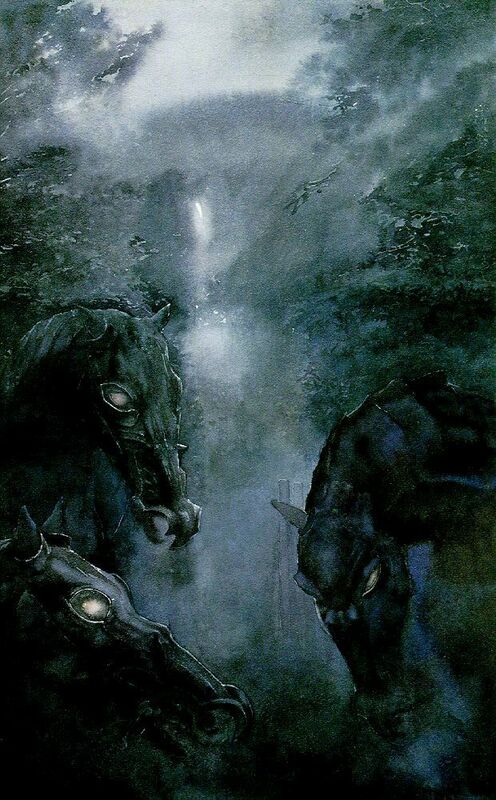 Unfortunately, the Riders arrive that night and Frodo falls sway to their compulsion. This encounter teaches us a few things. One is that while they may not "see" the mortal realm the way living creatures do, they can quite clearly see Frodo when he wears the Ring. The other is they cannot stand the light of Elvish blessing nor the bite of fire. I'm noticing a trend on Strider's part of making off-hand comments indicative of a dark future and a deep familiarity of what they are up against. Last chapter when Merry mused about Frodo's song and disappearance act that "The worthies of Bree will be discussing it a hundred years hence,' Strider replies "I hope so." What Strider is hoping for here is that civilization is around (and in such a healthy state where silly gossip and legends are thriving) in a hundred years, and not dead and fallen. In this chapter we get more comments, though a little less off-hand. Pippin declaired that Frodo was looking twice the hobbit that he had been. 'Do not speak of such things!' said Strider quickly, and with surprising earnestness. What's unsaid, and unknown to Frodo, is that is a legitimate real fear, and one that was starting to wear into Bilbo before he gave up the Ring. I've already mentioned that there's a good job of showing, not telling, as well as build up in tension with the Nazgul in the hobbit's guest chamber, so that all still stands. Clearly the Rider's don't bother with Crickhollow, since as far as the film is concerned it might as well not even exist. From the point of view of a largely visual medium filled with exposition, and in light of how much history is excised, I think it makes sense for us to learn the nature of the Ring Wraiths right off the bat. On the screen the Wraiths are too large, present, and threatening to ignore. Happily, the nearly week of travel from Bree to Weathertop is neatly cut down to a few shots... however dialog makes it seem like it's really just one long day. Knowing Jackson, the distances to this point may very well have been shortened that significantly. We get a brief interlude of the indomitable Christopher Lee as Saruman the White, carrying out Sauron's directives. I love the visuals that Jackson gives us surrounding Saruman, very strong atmosphere and setting with gorgeous contrasts. We also get hints of things to come with "The trees are strong," and the sheer scale of the deforestation implies a large plot. Gandalf still is captive, unable yet to hinder Saruman's plans or to aid our hobbits. At Weathertop it makes sense for our party to camp there for the night, even without the richer context Tolkien provides. I think it makes sense for Strider to arm the hobbits, though it of course means he assumes they have some ability to use the weapons... and I'm not sure why he doesn't caution them about fire, either to avoid it or to maintain one. Ignoring my confusion about Strider's complete absence until a dramatically appropriate moment, I love how the appearance and approach of the wraiths was done. Beautifully portrayed, with excellent framing and music. Jackson gives us wraiths a little more present in the physical world than Tolkien's. These wraiths have no difficulty seeing in the mortal world, but they are definitely called by the Ring. Here when Frodo dons the Ring, the wraith halts his attack and reaches for the Ring itself, before striking out when it's pulled out of reach. Visually I'm struck by the choice to make the spirit manifestations of the Wraiths as glowing white, while Aragorn stands out as an inky dark form.